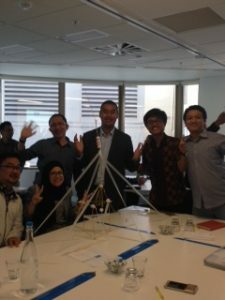 Build a team – with spaghetti! The Geothermal Institute are currently hosting a group of Indonesian and Phillipino geothermal energy professionals (from a wide range of disciplines) for a 4 week project management course. This course is being as a Ministry of Foreign Affairs and Trade sponsored initiative. On Day 1 I wanted to "break the ice" (though the group are warm and friendly) and get the course participants working in teams. 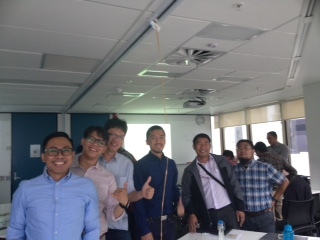 The course has plenty of time for "techy" group work so instead of a task with a geothermal focus I set everyone the "Marshmallow" challenge. This requires a group to build a structure to support some marshmallows using (dry!) spaghetti, and adhesive tape. Some versions also offer the participants some string - but none was to be found in my kitchen cupboards the night before! An outline of the challenge set up can be found here. Some of the structures that resulted look like this. Clearly specifying requirements matters in any project. I had forgotten to mention that the structures needed to be freestanding - so this group cleverly took their structure to the ceiling. 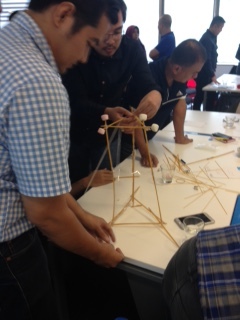 Group dynamics in the marshmallow challenge is the subject of a TED talk by Tom Wujec. So how do teams of various kinds do? Unsurprisingly it depends on the skills, and the mix of skills in the team. Tom Wujec's talk compares the performance of teams with different backgrounds in this graphic. When I revealed this image to our course participants they found the first few bars entertaining! Personally I enjoyed seeing the finding that teams which are a mix of CEOs and Executive Admins outperforms teams which are only have CEOs. The organisation and facilitation skills Executive Admins bring are a very important part of delivering on the project goal. I know the work I do really benefits from the professional staff around me who diversify the skill mix in the Department and the Institute. But why did the young children do so well? They experiment and prototype naturally - allowing them to test assumptions. That supports innovation and creativity. For more thoughts on being curious culturing creativity there's further discussion and advice here. Posted in Uncategorized and tagged Ministry of Foreign Affairs and Trade, project management, team building on March 21, 2017 by rarc002. A net-zero personal carbon footprint? on A CV of failures?